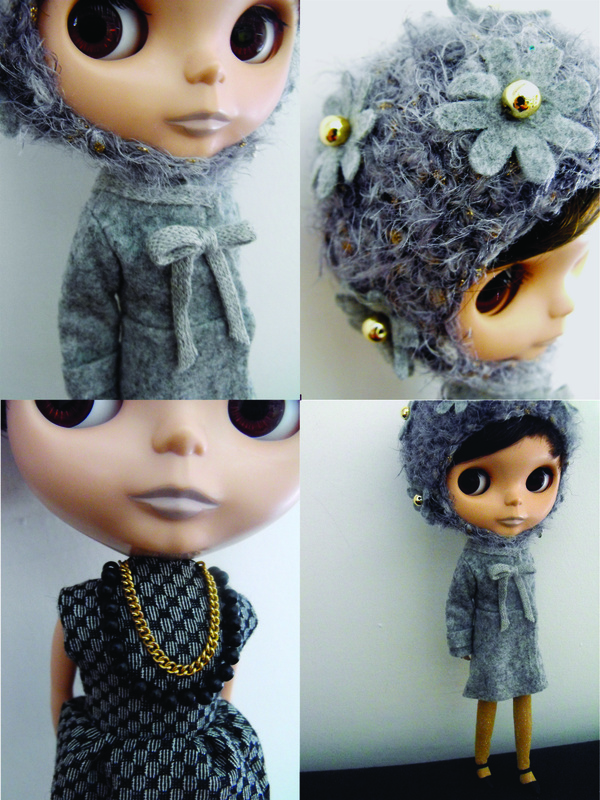 “Metropolitan Girl” an all grey set very inspired by my love for Marni! I’m very excited to announce my very first set for Blythe is on ebay now for a three days auction! The set takes inspiration from my love for the italian clothing brand “Marni”, it’s peculiar style of matching the retro shapes along with geometric innovations and the love for the femenine embellishments. All is in different shades of grey, which is one of the colors (well, one of the three colors) I wear more. MiniG is the model, you all know her style isn’t so much into too frilly and colored things…(-: think this set reflects my style too. -A BC limited Granny Hat made in a fluffy grey merino yarn, studded with golden touches, heather grey felt flowers, golden painted beads and the “Created For You” silver charm. -An heather grey felt coat, (felt is a known test for beginners!LOL), closed with a little snap and embellished with a woven matching grey ribbon.The shape is tight so you’ll have to pay attention in pull it a bit if worn on the dress of the same set. -The dress is very short to have a more fresh look, made from a “Bird’s Epattern cotton fabric in grey and black, decorated with a black organza trim (to let the fabric pattern always visible) and two little “necklaces”,one with little wooden black beads, one with a golden chain.